With spirits and mortals living in such close proximity, it’s no surprise that they occasionally do such things as result in half-mortal, half-divine children. Though mostly mortal, these god-blooded offspring often possess magical talents passed down to them from their spirit bloodline. Flavorwise, a god-blooded mechanic should express the connection between the mortals and spirits of Great Forks. But the last time we saw a major mechanic related to the Spirit creature subtype, it was in Kamigawa block—a watchword nowadays for underpowered, parasitic mechanics. This is something we want to avoid! How do we express a creature’s god-blooded nature? Auras are a good mechanism to represent individual magical knacks. If the god-blood has an Aura attached to it as it enters the battlefield, it gives us the feel of a person born with some magical boon. Academy Researchers has a much more limited power. It doesn’t provide card advantage, and it’s only as useful as the selection of Auras you have in your hand right now; you might not have a useful Aura in hand, or indeed any at all. 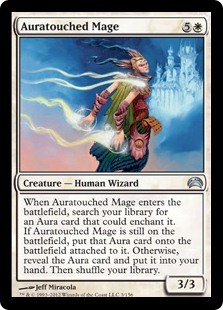 It’s also a bit harder to balance than Auratouched Mage’s tutoring ability, which is costed to account for the fact that you’ll always have a really powerful and expensive Aura in your deck to attach to it. That’s a little long for a keyword, but not dramatically so. 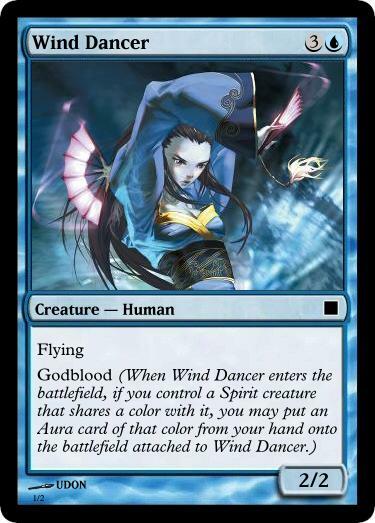 The Spirit restriction provides some linear guidance to deck design without being parasitic; you need a good mix of Spirits, creatures with Godblood, and Auras to make best use of the keyword ability. The color limitation provides flavor, but it also discourages its use in multicolor decks. There are a few ways around this if it turns out to be a problem for the block metagame; we can explore these later. Given the nature of the Magic design process, there’s no guarantee that this mechanic would survive the design process unchanged—or at all; many new mechanics are simply abandoned during design or development. As I lack a design team, a development team, and playtesters, this is kind of moot, but I’m going to stick to the principles as best I can for the purpose of the exercise. Next time, more new mechanics. Stay tuned! I’ve been asked to write up some Exalted-themed cards for Magic: The Gathering. This could be fun! But I’m not just going to write up some random cards for random Exalts and call it a day. I’m working to develop my game design skills, and building cards piecemeal does little to hone my abilities. Few Exalts. It’s difficult to effectively translate the mechanics of the Celestial Exaltation into M:TG, and the Dragon-Blooded elemental synergies don’t fit neatly into the color pie (40% blue, 40% red, and 20% green), making it difficult to incorporate them into a set. I’ll throw in a couple here or there, but they won’t form the backbone of the set. Focus on a small part of Creation. It’s a huge world full of countless unique societies, and throwing them together like gumbo only serves to muddy all that interesting detail. Set it in an existing 1e/2e location. Picking a location that’s being added in 3e would require breaking my non-disclosure agreement to provide any kind of meaningful detail, while inventing a brand-new locale would miss the point of working with an existing setting. Build the set as part of a cohesive block of three sets for drafting purposes, bookended by other blocks and basic sets for purposes of Standard format design. Obviously I’m not going to design all of those too, so I’ll just swap it in for a previous block. Build around a narrative. A real block would come with tie-in novels; I’m not planning on writing any, but a homebrewed block should have a narrative that a fiction writer could work with for this purpose. Planeswalker characters, some old and some new. Yeah, this means we have to have Liliana or Jace or whoever else show up in Creation. Cope. Multiple new mechanics and one recurring mechanic in the first set of the block. Later sets will have a new mechanic or two apiece; we can plan ahead for this if something really exciting pops up, but we can just as easily leave it for later—assuming this homebrew project gets that far. That’s all for now, as I have to finish dinner and head out to D&D. Later I’ll start work on the mechanics and design skeleton for the Great Forks set. Till then!